Seriously, GOP.com, what do you want? We took a close look at GOP.com today to see how they are countering WhiteHouse.gov, and have some free strategic advice for conservatives trying to rebound from Obamamania. Please, Republicans, blow up your web site and start over. 1. Create a personal GOP profile! 2. Join the GOP Facebook group! 4. Join the Young Eagles! 5. Shop the GOP store. 6. Create a profile (redundant link). 12. Path for (or to find?) elected officials. 16. Visit the RNC’s Center for Republican Renewal. 17. Download the GOP search bar! 18. Check the event in January! We imagine a future Rush Limbaugh hitting this site, desperate to get involved in restoring the Republicans to power … and falling asleep at his desk after 10 minutes of puzzling over what the hell to do. 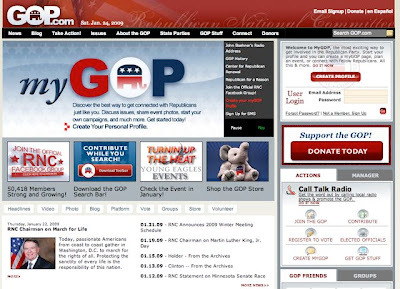 For web strategy shops, we highly recommend you reach out to GOP.com and pitch them a redesign. The right is struggling and this bizarre communications approach is going to get them nowhere. It’s a good test for your own business, too. If someone visits your web site, could they find what they want in 2 seconds? And can they understand what action you want them to take?